Trend Alert: Bold Is Better! Traditionally, Quinceañera colors have been white or pink, but many of today’s teens are combining tradition with modern style and opting for bright colors for their special day. 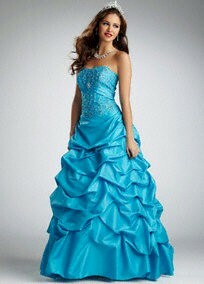 This season, Quinceañeras will find dresses in bright blues and greens, hot pinks and purples, sunny yellows and more. Dresses aren't the only place to find color. 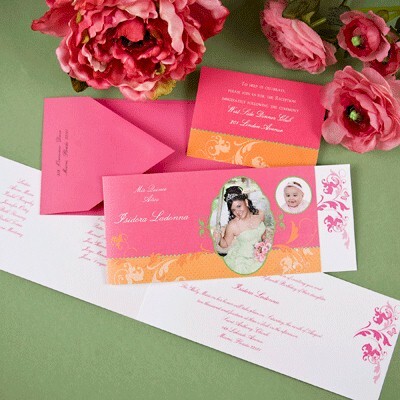 These vibrant Quinceañera Invitations are sure to brighten up any mailbox! 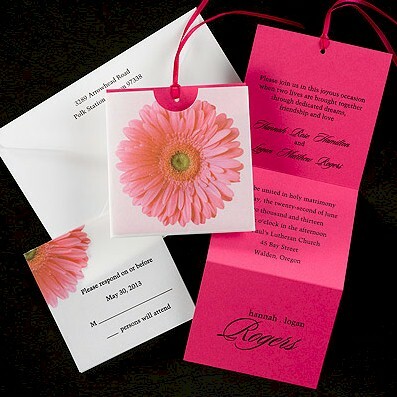 This pink, z-fold daisy invitation fits into a translucent pocket featuring a bright fuchsia daisy on the front. Pre-cut ribbon in a cheery array of color options is included. This tea-length invitation features a popular fuchsia and orange color combination and photos of the Quinceañera. Mis Quince Años and the Quinceañera's name are printed on the front, the court of honor is printed on the left inside panel, and the invitation verse on the right inside panel. 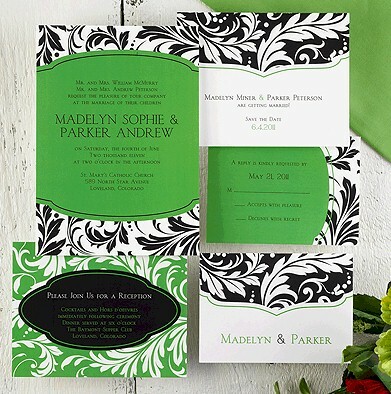 This elegant floral inspired invitation is available in four background color options. It is shown here in "French Kiss." 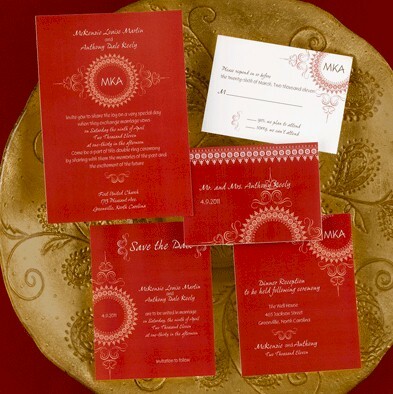 Stand out in style with this deep red Moroccan inspired invitation featuring your monogram. 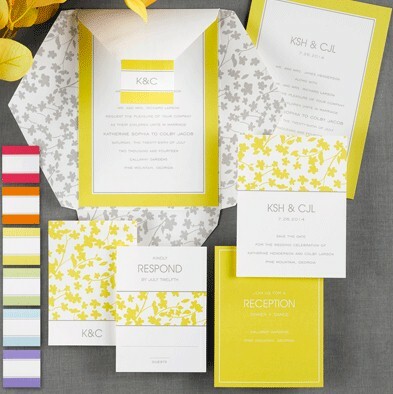 This sunny invitation is sure to brighten anyone's day. 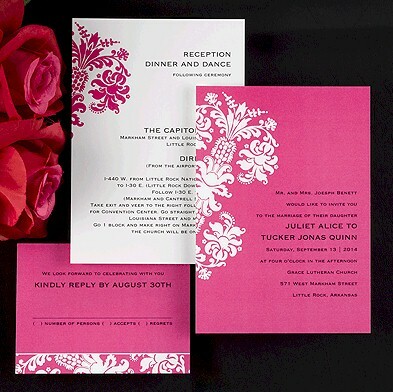 The white pocket contains a floral pattern inside and holds a colorfully bordered invitation. 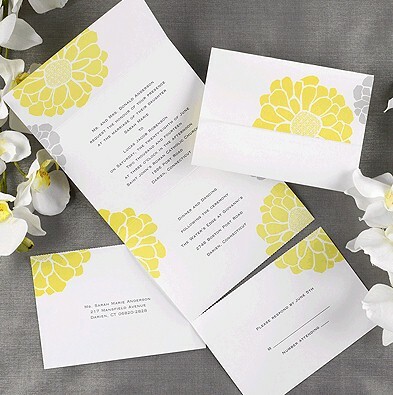 Simplify things with this bright white seal 'n send invitation featuring a yellow design and slate colored flowers. Price includes printed seal 'n send, perforated respond postcard and clear, round seals. 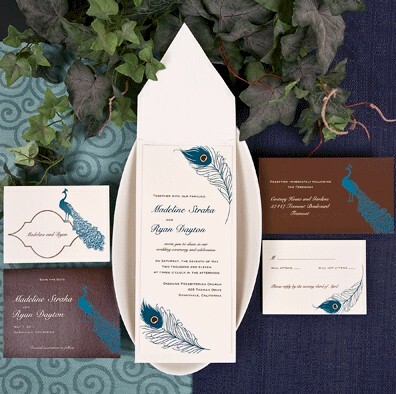 Two peacock feathers, in Oceanside blue and espresso, encase the your wording on this ecru colored tea length invitation. Informal note cards are printed with an elegant peacock in Oceanside blue with space to include your name. For details and assistance with ordering any of the invitations shown on this page, please Contact Us.